Book Description: The Print-on-Demand Guide is a practical manual on the what, why, and how of creating a bound, printed copy of any openly licensed textbook found in the B.C. Open Textbook Collection. However, these same steps can be used to create a print-on-demand textbook from other collections providing you have access to the correct file types. The Print-on-Demand Guide is a practical manual on the what, why, and how of creating a bound, printed copy of any openly licensed textbook found in the B.C. Open Textbook Collection. However, these same steps can be used to create a print-on-demand textbook from other collections providing you have access to the correct file types. Print-on-Demand Guide by Lauri M. Aesoph is licensed under a Creative Commons Attribution 4.0 International License, except where otherwise noted. 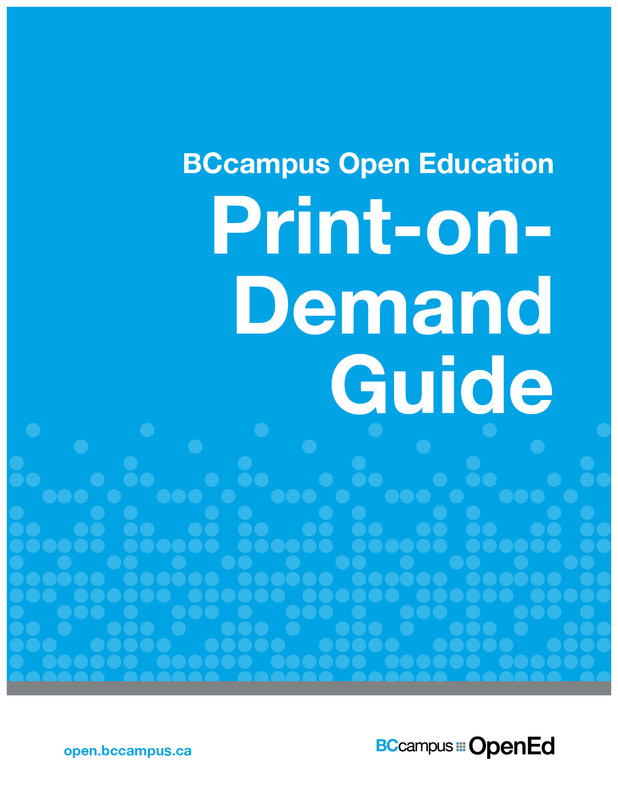 The BCcampus Open Education Print-on-Demand Guide by Lauri Aesoph is used under a CC BY 4.0 International Licence.